Ett opastöriserat och ofiltrerat öl, bryggt på hantverksmässigt sätt med råvaror från Båstad. Flaska. Grumligt bärnstensfärgad öl med medelstort vitt skum. Doftar malt, körsbär och vinäger. Smakinslag av malt, sur frukt och trä. Svag beska, medelsötma, liten kropp. Lite som att dricka en juice som har stått och blivit gammal. Inte gott alltså. @ Röhällavägen. Bottle (330 ml) from Systembolaget (29:-). Fruity with yeasty notes, slightly tart, apples, light to medium body and oily texture. The finish is dry and bitter with some acid notes. Bottle. Pours orange golden with a medium, creamy, off-white head. Aroma has sweet malts, caramel, light brewing cereal, light grapefruit hops. Medium carbonation, fine dry and light mouthfeel. Flavour has sweet doughy malts, light caramel, soft piney and light grapefruit bitterness. 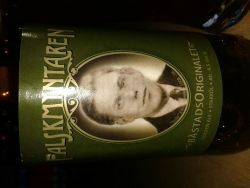 Bottle from Systembolaget. Fruity smell with primarily apples. Spritsy beer with a slight tannin harshness to it, like the peel of an apple. The taste isn’t as fruity as the taste. Bottle, rated from backlog. Hazy golden with small white head. Aroma and taste is malty with some esters, bread, grain and apples. Very much flavor in this beer with a good aftertaste. A little odd taste only okay to drink. Appearance: Hazy deep golden color with an off white head. Ok lacing. Palate: Medium body. Moderate sweet and a light bitterness. Average carbonation. Taste: Caramel malt, fruity and a bit citric. Overall impression: A pleasant beer. Personal stats: Bottle from a trade with rlgk. Bottle @ FOneFan. Unclear amber/orange with small white head. Aroma is malt, fruit, phenols, plastic and yeast. Flavour is malt, yeast, plastic, fruit, hop, little sweet, apple and phenols.